Sam Hulick of Mass Effect fame took a moment to talk about his work on the upcoming Baldur's Gate Enhanced Edition. Sam Hulick is a talented dude. 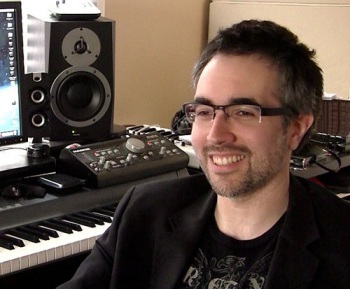 He got his start working with Jack Wall, Clint Mansell and several others on the award-winning Mass Effect soundtracks, but he's flying solo for his latest project, scoring the new segments in the upcoming Baldur's Gate Enhanced Edition. "I met Trent Oster for the first time in March 2011, at the W Hotel during the Game Developers Conference. I recognized him from video interviews years ago for Neverwinter Nights, so I introduced myself and we chatted over beers about the good ol' days of RPGs," Hulick said in a recent bit of chit-chat that did not, in actual fact, include a fire. "About a year later, the baldursgate.com site popped up and made news everywhere. On a hunch, I emailed Trent and asked him if he knew what was up with that Baldur's Gate site. He shot back a one-word email that simply said, 'yes'," he continued. "About a month later, with the next Game Developers Conference approaching, Trent and I started emailing about plans to meet up. He said he wanted to talk to me about writing a few tracks for a 'little' project of theirs. We had our meeting, the project was exactly what I thought it was, and the rest is history!" Hulick said that his approach to making music for the Baldur's Gate remake is "totally different" than on Mass Effect. "With Mass Effect, composers were brought in fairly late in the game, meaning there's a lot of material and working gameplay to look at," he explained. "With Baldur's Gate, especially the material I'm working on now, a lot of it is still being designed, and so I'm working mostly off of concept art and static map art, and of course direction from the team. I think with a more old school RPG like this, you can get away with coming in early, which is nice. There's more breathing room and time to soak things in." He also has the benefit of having a tone set by the pre-existing and much-loved soundtrack from the original Baldur's Gate games. While he hasn't been in touch with original composer Michael Hoenig, Hulick said he made a point of ensuring that the new music would ring true with fans of the game, some of whom had "mixed reactions" to his hiring. "Some people were excited or hopeful, and some were wary of me not quite hitting the mark. I expected that though - after all, Baldur's Gate has a huge cult following and I'm glad people still care that much about the game and its music," he said. "Anyway, after a few sample clips from 'The Black Pits' were released, there was an overwhelmingly positive response from the fans who were surprised by how close the new material sounds to the original score." Samples of "The Black Pits" score are up on Hulick's website and while brief, they are both excellent and very true to the original, to the point that they could probably be slipped into the Baldur's Gate soundtrack without anyone noticing. For a remake of such a deeply respected RPG classic, that's a very good thing. The Baldur's Gate Enhanced Edition is scheduled to come out on November 30 for the PC, with iPad, OS X and Android editions set to follow later.